We are happy to welcome new patients to our practice with this special offer. This appointment typically lasts one to two hours and will result in a complete evaluation of your oral health and any cosmetic issues you want to address, as well as a treatment plan. This is also a perfect opportunity to get a second opinion on dental treatment you may have been told you need elsewhere. Call us at 610-642-6965 to make an appointment or click here to request an appointment online. Are you looking for a smile makeover? Interested in finding out just what veneers or porcelain crowns could do to improve your smile? Come in today for a complimentary consultation with Dr. Snider. With more than 25 years of experience, Dr. Snider will show you how you can have a beautiful, natural. Find out more about how Invisalign transforms smiles. 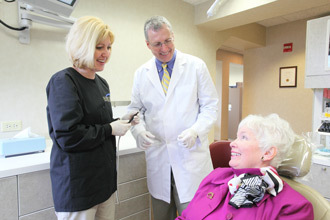 Come in today for a complimentary consultation with Dr. Snider. You’ll get an opportunity to discuss your goals, treatment options and get any questions answered. And he’ll perform a free oral examination to determine if you’re a candidate for Invisalign. If you haven’t seen a dentist for a while, or know that you need more than minor dental work, you should take advantage of this offer. Dr. Snider will perform a thorough examination, and discuss with you your options for dental treatment to restore your smile to full health and function.